Neem is highly beneficial for oily and acne prone skin. When there is infection that is bacterial and fungal in nature like we see in case of pimples and acne and several scalp related problems. Neem or Margosa is used extensively in various skin care products that are targeted for oily skin, pimple prone skin and for the hair care products where the dandruff is seen. 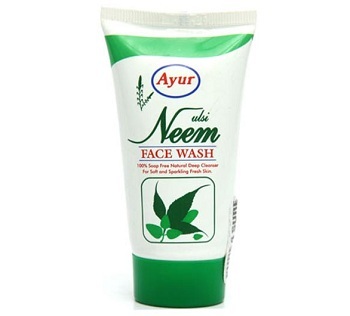 Neem face wash can be extremely helpful when we are struggling to prevent and clear the pimples from the face. 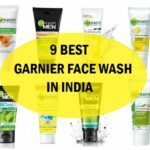 Here we have made this list of 15 best Neem face wash available in India. 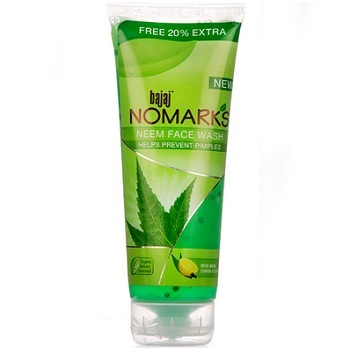 Neem face cleansers are not just for oily skin and skin which is prone to acne but for the normal to dry skin as well. This is due to the fact that neem is neem in neem oil which cleanses the deep seated impurities. They will unclog the pores hence keeps the skin clean. Moreover, even for dry skin this will prove to be quite nourishing. 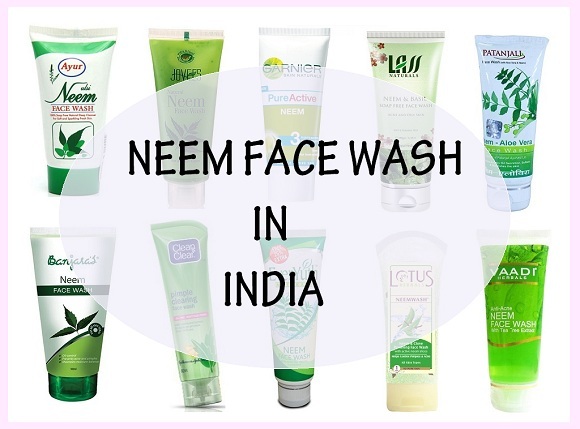 Neem facial wash will help to cure the most annoying skin problem and that is blackheads and whiteheads. Men too suffers from blackheads. They look really terrible hence, these neem wash will uproot them by keeping the pores clean. 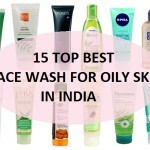 We have used quite lot of neem face washes hence knows the inside out of these cleansers. You too can try them to make the skin clean and clear. 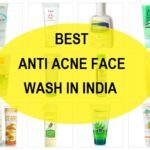 Do check out these neem face cleansing products for oily skin and acne prone skin along with their reviews. One of the most popular Neem wash is Himalaya neem which is very gentle and the neem extracts makes the skin pimple free within days. This brand is popular and very easily available at inexpensive price. the neem extracts in this cures the swollen acne and reduces the skin inflammation. 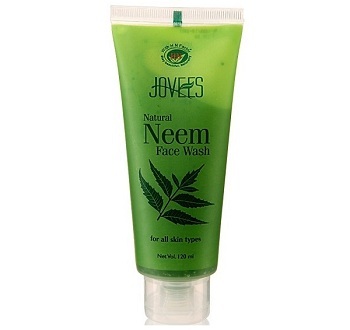 Jovees Natural Neem Face cleanser has medicinal properties of neem and other herbs that is highly beneficial for the pimple control. It fights the acne for the oily to combination skin. This face wash removes impurities, dead cells and lighten the complexion. 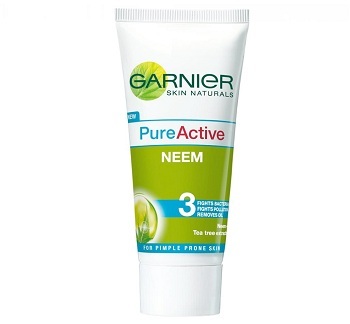 Garnier Pure Active face wash is formulated with the pure neem and extracts of beneficial tea tree. They both are pimple reducing and clearing agents. It lathers well and cleans the skin with no excessive drying of the face. Hence you will not need a lot of this product. I feel that this is one of the best amongst the neem cleansers. Price: This face wash is just for rupees 35 rupees. 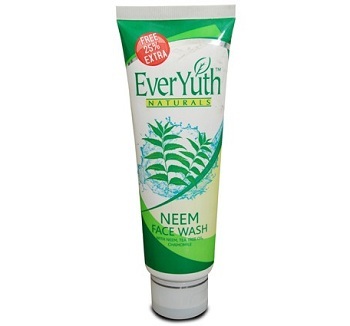 Everyuth Naturals Face Wash is enriched with Neem, Tea Tree Oil and Chamomile. All these herbs very gently deep cleanse the skin and eradicate the pimple forming bacteria. This will also control excessive oil secretion on the face. I liked it when I was in college and would buy this since the price was very cheap. 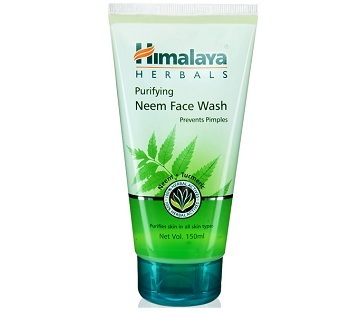 Shahnaz Hussain Neem Tulsi Face Wash is an effective option for people looking for anti acne face wash. This eliminates the impurities and dirt, oils on the face. It doesn’t disrupts the skin’s natural pH balance therefore will not dry out the face. Its herbal ingredients adds skin moisture and at the same time fights acne and pimple causing bacteria. This face wash has neem extracts along with the clay which squeeze off the excess oil and also helps control the oil production on the face. It keeps the skin shine free and oil free for a long time as per the claims. This foaming face wash with neem deeply cleanses the pores and to get rid of the excess dirt/oils for a clean and clear skin. The herbal clay aids in reduction of pimple marks and the neem extract prevents the pimples formation. I really like this as the light greenish color with a mild smell is very refreshing. 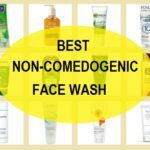 It is not at all for dry face. 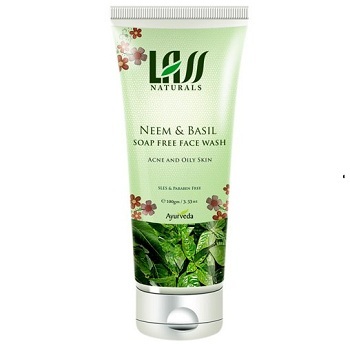 Patanjali neem and Tulsi face wash is ideal for very oily skin which struggles with pimples and acne like that of the teenagers. People with over excited sebum glands can use this as this strips oils from face.This face wash eliminates the bacteria that forms pimple infection. I find it drying for my combination skin hence, I will only recommend this to very oily skin and not even for mildly oily face. 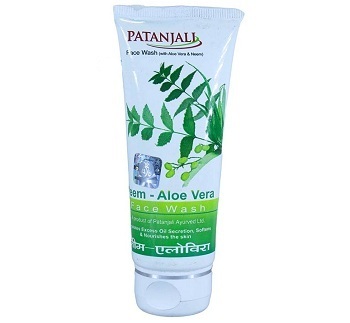 Patanjali is a product by Baba Ramdev and this face wash contains ingredients like Neem which is anti bacterial and aloe vera which has the skin soothing properties. Both of these are very good for oily acne prone skin to keep the pimples away. 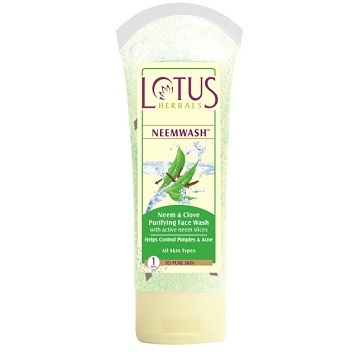 This Lotus Herbals Face Wash is not just a neem face wash but it is also enriched with the powerful pimple clearing properties of the clove extracts. It gives good pimple protection and when used regularly eliminates the acne and pimples from the face for a nourished smoother face. 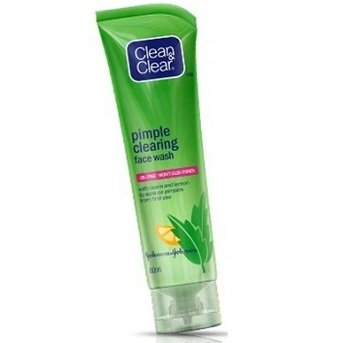 This Clean and Clear mild pimple clearing face wash is fortified with the power of neem and lemon. Neem takes care of the pimples and lemon removes the blemishes and pimple scars. 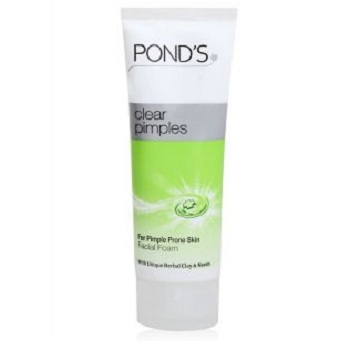 It claims to give a smoother clear, pimple free skin in 7 days. This herbal face wash for oily skin has the natural herbals extracts of tulsi (holy basil), aloe vera and neem to purify and deep clean the skin thoroughly. It is formulated with a soap free formula which is mild and gentle for the skin. This affordable face wash also claims to tighten the pores, takes excessive oils and dirt and relive skin from dryness and itchiness. Ayur Neem facial cleanser is a soap free formula which deep cleans the skin and purifies the pores by taking off dullness and dead cells. It is a great combination of herbal extracts and has antibacterial neem to prevent acne and pimples. 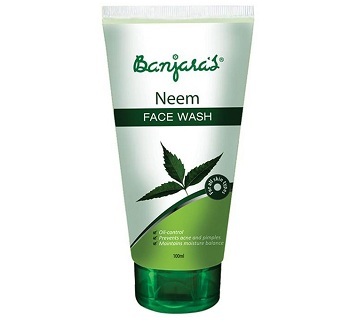 Banjaras Neem Face Wash is gentle for skin and slough off the dirt, oils, greasiness and even the makeup along with the skin impurities. Its neem component prevents the acne and heals the pimples. Neem is very effective in pimple control. I like this face wash as this forms mild subtle lathers that cleanses my skin gently. 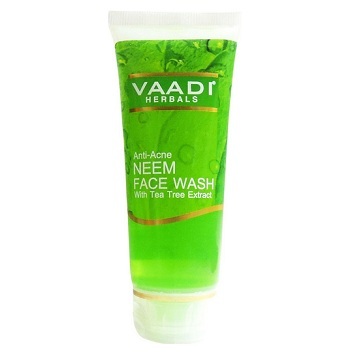 Moreover, it does not stretches the skin post wash.
Vaadi herbals make this gentle neem face cleanser that lather softly and cleanses the skin thoroughly to prevent acne problem for a skin free of pimples. This smells refreshing and mild. It does not dry the face but still should be tried be tried in less amount. This Bajaj face wash has neem and other herbal content which makes it good to control pimples and ward off their infection. It also has the power of lemon which are rich source of citric acid. Citric acid too cures the acne and pimples by raising the acidity levels.